The next three months will be crucial to the US government's plan to supplant radio frequency communications in favor of optical communications. Using special equipment flown to the International Space Station by a SpaceX Dragon cargo craft, astronauts will test an optical laser communication system or lasercomm that has the potential to increase Internet download speeds by as much as 256 times. This optical communication in outer space experiment is called OPALS (Optical Payload for Lasercomm Science). Lasercomm is one of the emerging technologies NASA is intent on trying out. With lasercomm, data is transmitted via laser beams. Lasercomm offers much higher data rates than NASA is able to achieve with the current radio frequency or RF transmissions it currently uses to talk to the ISS. Many of the latest deep space missions send data back and forth at 200 to 400 kilobits per second. Lasercomm is expected to transmit data at 50 megabits per second. Considering one megabit is equal to 1,024 kilobits, this means that lasercomm should transmit communications at up to 256 times faster. 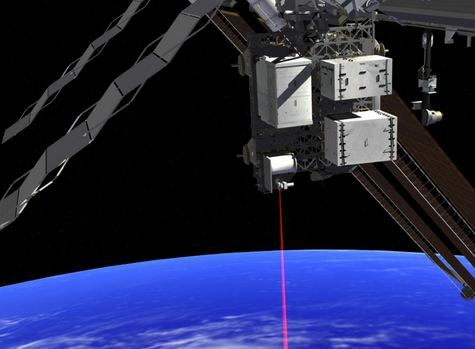 The new lasercomm system is a key part of NASA's Space Technology Mission Directorate, an arm of the space agency focused on developing technology for future space missions. "Optical communications have the potential to be a game-changer," said mission manager Matt Abrahamson. "It's like upgrading from dial-up to DSL. Our ability to generate data has greatly outpaced our ability to downlink it. Imagine trying to download a movie at home over dial-up. It's essentially the same problem in space, whether we're talking about low-Earth orbit or deep space." The lasercomm device will be attached to the external hull of the ISS. The lasercomm test is expected to take at least three months. During the test, a ground telescope will track the ISS as it orbits the Earth and transmit a laser beacon carrying a video uplink in 100 second bursts to the lasercomm device. The tests will help scientists better calculate the ability to point the laser while the ISS is traveling at 17,500 miles per hour.